In the event of rain, screenings will occur in the council chamber in Village Hall. In honor of Independence Day, we will be closed on Monday, July 5th. We are also closed all Sundays through the summer, so be sure to pick up your weekend reading/viewing on Saturday! After reading six books, the official program prize is yours. Remember to enter our drawings for weekly prizes. 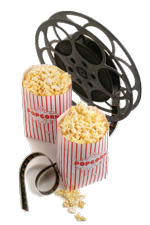 Once again, we’ll be giving out our popular free video rental coupons good for every book read. Two grand prizes will be awarded at the close of the program. Whether you choose to journey near or far, plenty of booklists will be on hand to guide you. Happy reading! Thanks to the Friends of the Glencoe Public Library for their generous support of our Summer Reading Programs. The Ravinia Festival has donated a limited number of lawn passes to area libraries for distribution to their patrons. We will begin distributing tickets on Saturday, June 5 to Glencoe residents only (age 18 and up) on a first-come, first-served basis. There is a limit of two free tickets per household. Tickets go fast, so come on by first thing on Saturday for the best selection!